Andrea Moretto was born on 7th March 1975 in Ivrea. For years he worked as a mechanical designer, before becoming a teacher in technical design and technology. In 2005, his mother gave him a 2-cup Mignon coffee maker, which has an unusual shape and operates differently to traditional coffee makers. Fascinated by the curiousness of this model, Andrea started to develop an interest in Italian coffee makers. For his wife, however, this was the start of what can only be described as “torture”, as their kitchen and garage gradually filled up with all kinds of coffee machines in various unusual shapes and sizes. Andrea set up a special website in order to share and find new information. 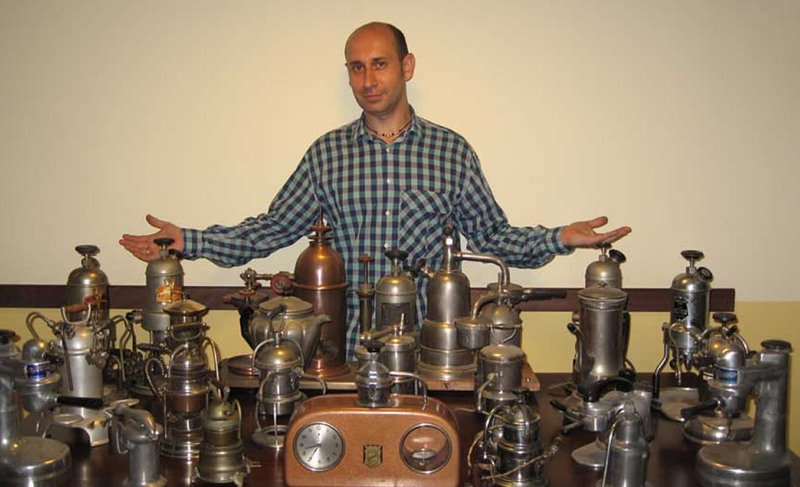 He met Lucio Del Piccolo and Giorgio Gennaro and, thanks to them, has built up in-depth knowledge of coffee makers. He is the artist who produced all the original drawings in Coffee Makers, illustrating how the various machines work.